. :The James D. Orchestras & Specialty Entertainment, LLC:. 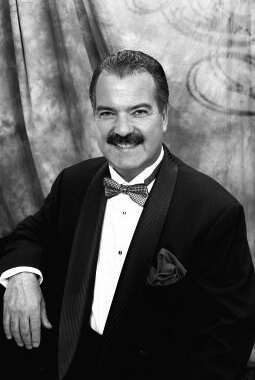 Versatile and multi-talented... words which best describe James Dell'Orefice, pianist, conductor, composer, producer, creator and general manager of the James D. Orchestras and Specialty Entertainment, LLC. Jim brings to the table a plethora of impressive credentials. Jim began his musical study at the age of six and in the process, was the recipient of many local music awards. A graduate of the University of the Arts (BM) and Combs College of Music (MM), he went on to work with such luminaries as Sammy Kay, Ray Eberle, Frankie Lester, Bob Hope, Joan Rivers, Clark Terry, Lee Konitz, Lorna Luft, Little Anthony and the Imperials and Petula Clark. For many years, Jim toured with Connie Stevens as her Pianist and Assistant Conductor. He has recorded with Bobby Rydel, Al Alberts and many other prominent local musicians. In addition, Jim has also recorded his own CDs. His musical journey has taken him to Las Vegas, Broadway, Atlantic City and back to Philadelphia. At venues such as Carnegie Hall, Trop World, The Wilmington Opera House, The Philadelphia Academy of Music and the Keswick Theatre, he has filled the roles of composer, conductor, director and performer. Jim's keen understanding of entertainment has expanded his experiences directing dance ensembles and writing commercial jingles for media events. Among the highlights of his career are command performances for Luciano Pavarotti and President Bill Clinton. The James D. Orchestras and Specialty Entertainment, LLC is the brainchild of Jim Dell'Orefice, a musician's Renaissance Man. Under his direction has emerged a unique entertainment format which provides a broad spectrum of musical choices for both the social and corporate client. Drawing from his extensive professional experiences, Jim brings together a network of premier musicians from throughout the Delaware Valley, New Jersey and New York areas to accommodate a diversity of musical tastes. From soloists to dance ensembles, Jazz bands to 28-piece orchestras, mimes to magicians, the James D. Orchestras provides a cornucopia of entertainment selections with broad appeal. In between recording, producing, composing, teaching and conducting for the James D. Orchestras, Jim leads the Pop 'N Strings program for Strings for Schools now known as Musicopia, a non-profit organization devoted to opening children's minds and hearts to the world's finest musicians and most enduring music via live performances in schools throughout Philadelphia and the Delaware Valley. Jim is an active member of the Philadelphia and Atlantic City Musicians Union.